Вилла Baan Sawan расположена на севере острова Samui, в 5 минутах ходьбы от традиционной рыбацкой деревн Bophut. Вилла имеет великолепный вид на море и на остров Phangan. Здесь комфортно могут разместиться как дети, так и пожилые люди, что делает виллу идеальным местом для семейного отдыха. Великое множество развлечений ждет вас в этой части острова Samui: вы можете загорать на пляже, заниматься дайвингом, кататься на велосипеде или заниматься пешим туризмом. Любители игр в гольф или теннис могут с удовольствием посетить клуб гольфа Bophut Hills и теннисный клуб Bang Rak. Вилла Baan Sawan спрятана в самом сердце восхитительных ландшафтных садов с тремя со вкусом оборудованными спальными комнатами, которые были созданы для отдыха и релаксации. Стильные гостиные и другие жилые зоны имеют высокие потолки, чтобы сделать помещения более просторными. Вилла также может похвастать великолепный бескрайним бассейном с большой террасой с шезлонгами и верандой, где вы всегда сможете укрыться под тенью. С террасы и веранды наши гости могут любоваться потрясающим видом на море. Прекрасный ужин под открытым звездным небом с необычайно красивым видом на океан навсегда останется в вашей памяти. Had a great stay at the Baan Sawan Villa, I stayed there for my 40th birthday get away with two more ladies. The house is decorated very stylish, there are three bedrooms that are quite big and spacious. 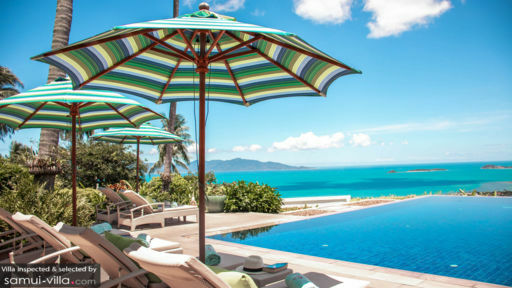 They have a infinity pool which has great view on the hilltop that over looks samui. 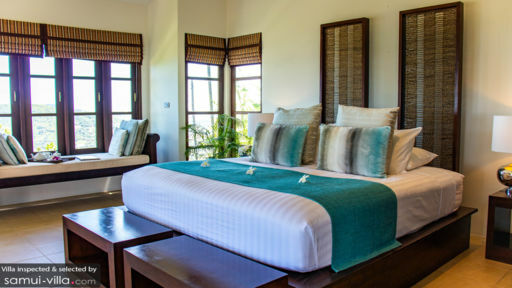 There is a fantastic ambiance here and it's quite and down to earth settling is very relaxing and feels like you can have a customized retreat of your own because you can book in house massage and a great choice of food which you can dine in the villa. I can see that you could quite easily have a quaint wedding here or a great family holiday gathering! Great thanks to Star she is the manager and was a fab host! Like it! We felt that the level of service we received was excellent. We knew in advance that Star, the manageress, wasn't going to be in Koh Samui during our visit however she kept in touch with us on a very regular basis, both in the run up to our holidays, and whilst we were there, giving us helpful tips on what we could do during our vacation. Her husband, Levy, looked after us very well, knowing when to be on hand and knowing when to give us privacy. He even drove after us on his motorbike one day when he realised we were heading in the wrong direction for where we had planned to go! 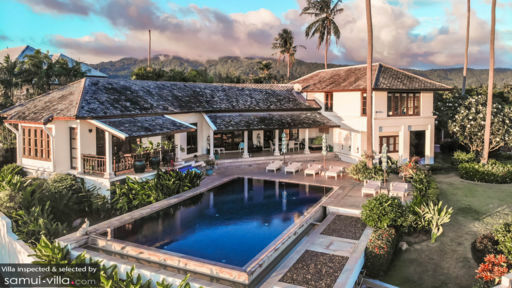 Baan Sawan is a spectacular villa with incredible views and highly experienced staff. We thoroughly enjoyed our stay at the villa and aim to return next year. The villa is also conveniently located to both beaches, shops and the airport. My family and I stayed at Baan Sawan 22nd July - 1st August and it was absolutely fantastic. As a group of 5 adults and 3 children - it was perfectly suited. Star and Levy definitely made us feel at home and were fabulous with the children, fantastic chefs too - we did eat out, but nothing compared to the freshness and care taken with our meals/BBQ at the villa. The gardens and pool are a credit to Levy, so well cared for and just absolutely stunning. Star made sure that any activities were organised in advance for us and made the whole stay very carefree and relaxing. The villa itself is modern and very well equipped, the views are unbelieveable (I cannot emphasize this enough - just breath taking) and I would recommend this place very highly to anyone. We were very sad to leave and the whole family would love to return and stay again - we couldn't keep Jacob or the twins out of the pool! We travelled as a group of friends (3 couples and and a two year old child) and stayed 4 nights at Baan Sawan. After travelling from Phuket, we definitely saved the best for last, and were all immediately blown away when we arrived at the villa. The place seemed a lot bigger than the photos we had seen, especially the pool (which was big and deep enough for us 6 adults to practice a few flips and dives). Star and Levy proved that they were the ultimate hosts as everyone mentions in their reviews. The food they prepared us was the best Thai we had the entire trip, and everything else from taxi's, laundry, and tour organising all was very prompt and stress free. The villa is quite out of the way (10mins up a steep hill), so I would look into hiring either a car or some powerful scooters/motorbikes to make access easier next time. We did find a couple of taxis that took us back there after a night in Cha-weng, however be sure they will take you up the hill before you actually get there. The only negative about the house itself, was the joint guest bathroom which had a very strong, bad musty smell. When we told Star, she was aware and herself and Levy did their best to rid of the odour in the meantime to getting it fixed. I think it was something to do with the ceiling. We had an awesome time, and will definitely recommend Baan Sawan to friends and family travelling to Koh Samui. The views and location of this villa together with the exceptional service provided by the hosts Star and Levy. She made it so easy to relax and enjoy the family time together. Together they arranged everything and to have breakfast laid out every morning in front of the view was such a treat. She is a spectacular cook and organised all the food shopping so all we had to do was sit down and relax and enjoy it. This made being on holiday with grandparents and no husband a dream as everything was taken care of. I will defintely be back again with my husband next time so he can enjoy their hospitality too and of course the views! I wanted to wrap them up and take them home. We spent 10 days with our adult kids. We had a warm welcome by Levy,Star ( villa manager) and Oozie, their little friendly dog. Everybody agreed Baan Sawan is a dream place to be in Koh Samui. The incredible views, the nice breakfast put together by Star and the quiet time spent at the pool were precious and will be memorable in our mind for a long time. The villa is very clean and decorated with fresh flowers all the time. The garden is well taken care by Levy. We wish everybody could enjoy this place once. We definitely want to go back in the future! This was our third visit to Baan Sawan Villa, and although it had been 7 years since our last visit, the villa, the staff and the whole experience was still as lovely as we remembered. The villa is as beautiful as ever; well appointed and extremely comfortable. The huge, lush, green garden had matured and was a stunning decadent addition to the terrace and pool area. The views across the valley below the pool terrace, out to the Bohphut beach and the islands beyond were magnificent, both day and night. The on-site staff: Star and Levy went above and beyond to assist in any way they could; including preparing delicious meals, organising a private chef to come to the villa, suggesting restaurants and making reservations where necessary, as well as keeping the villa, the pool, terrace and garden looking immaculate for us, throughout our stay. All of this was done with minimum fuss, and intrusion and always in a friendly and helpful way. A car is advisable as the villa is situated at the top of a long, steep hill, high in the hills overlooking the Bohphut area and beyond (but this is one of the things that makes it so spectacular). Levy arranged this for us in advance and a suitable vehicle was delivered to the villa on our first morning. Levy was kind enough to drive for us, when we didn't feel like driving, or the desire for a few cold beers with dinner was too much! A car gives you the flexibility to visit other beaches and other parts of the island, none of which are very far (it took us less than 1hr 15 minutes to drive around the whole island). Driving is on the left and is easy and we never had any issues finding suitable parking. There is really nothing I can add, but to say that I'm sure you won't be disappointed if you decide to visit. Hopefully we will be returning soon. Just had the best week at Baan Sawan, awesome location with stunning views over Bo Phut and out to sea. Villa was always clean and top selection was served for breakfast. Star and Levy were very friendly and helpful. Ozzie the dog was an unexpected bonus. Hope to go back. Just stayed at Baan Sawan for 2nd time. The weather was excellent and enjoyed the swimming and garden very much. The pool has an amazing view over the ocean and Koh Phangan. The staff at Baan Sawan were fantastically helpful as ever and Star is an excellent chef. I would really recommend the BBQ's and Thai curries! Thank you Star and Levy for such a wonderful holiday. The view from the villa literally took my breath away! Every thing we needed for the two babies under two was there at the villa- from toys to monitors, cots to cups, anything we needed was there. The villa is beautiful and tranquil, the pool spectacular, the gardens immaculately maintained and the kitchen fully equipped to cook up a storm. Star can arrange whatever you need- trips, taxis, even a massage while the children nap.. Bliss! Thank you again and we will see you soon!! Star me Levy, you have made our holiday with 2 small babies and their grandparents the most amazing, relaxing and decadent time. Thank you for finding all the little extras. Thank you again and look forward to returning. It is our second stay at the villa with my parents and our friends, and everyone spent a great time! Baan Sawan is very tastefully decorated, with high ceilings and an open space. The garden and the infinity pool add to the charm of the villa. And it has one of the best views on the island! Adding to all these nice features, is the attentive service of Star and Levy, the house managers. It's very quiet and yet a few minutes' ride away from Bophut's Fisherman Village, and the nearest supermarket. We have looked around at similar types of accommodation (villas, private or in hotels), and Baan Sawan has by far the best value. We all hope to come back next year!